For many years I have been a huge fan of the railroads that helped to build this country and many others around the world. I especially love to travel to areas where the railroad is the only way in or out of town, such as the Agawa Canyon run on the Algoma Central railway here in Ontario. I try to imagine what it would be like to live in such a place. Well - the fact is as the west began to open up there were many towns that sprang up along the railroads where that was exactly the case. Not only that, but many of these towns were temporary, picking up and moving with the railhead as the line was being built. In cases like these putting up a church was largely regarded as a waste of time as by the time the church was finished the town had moved on. As a result the spiritual needs of the folks in these towns went largely unmet. One man, an Episcopalian - Bishop Walker, had an idea. Why not outfit railroad cars as chapels? These could be pulled to where they were needed and would cost just two or three thousand dollars each to buy. He couldn’t see why it wouldn’t be successful, all he needed was some like-minded people to help to finance the project. Walker was good at selling his idea. Cornelius Vanderbilt, one of America's richest men at the time, gave the first donation to the new ministry and Walker's first chapel car was delivered in 1890. 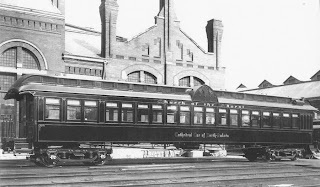 For the next ten years "The Cathedral Car," as it was called (pictured), traveled over seventy thousand miles throughout many remote areas of America, especially areas where the railroads had just opened the way. As with any church anywhere, many who attended the services held in the rolling sanctuary accepted the Christian message and saw their lives changed for the good; others had the faith they already had strengthened by the experience of worshiping with others. Before long other denominations followed the Episcopalian lead also sending chapel cars to the west. The Roman Catholic church built three cars named for St. Anthony, St. Peter, and St. Paul. Seven Baptist chapel cars were constructed and commissioned. The first of these, called "Evangel" seated one hundred worshipers and was dedicated in Cincinnati Ohio. The ten foot wide by sixty foot long car was hooked up to the engines of the Northern Pacific Railroad free of charge. This was because one of the supporters of Reverend Boston W. Smith, who spearheaded the project was the brother of the NPR’s General Manager. They also organized the syndicate that raised the funds to build more of "Uncle" Boston's cars. The syndicate included such prominent men as business tycoon, John D. Rockefeller, and Thomas Edison, who provided the rail chapels with his new invention - the phonograph. The novelty of the recordings became a drawing card for the Baptist services. The other six Baptist cars were named Emmanuel, Glad Tidings, Good Will, Messenger of Peace, Herald of Hope, and Grace. Along with two other Episcopal chapel cars named only Diocese Car of Northern Michigan #1 and #2, a total of thirteen chapels cars spent a total of five decades traveling the ribbons of steel laid across America. The last of the chapel cars was retired in the 1940s. Not everyone appreciated the rail bound churches. In Oregon, one car was pelted with eggs, marked with graffiti and set afire. However, by the grace of God and the actions of nobler individuals in the local population, it survived the ordceal. The idea was borrowed by other countries, too. The Orthodox used them in Russia, Presbyterians in South Africa and missionaries in China. There were even a few in Great Britain that actually pre-dated the American projects. I don’t know exactly when Walker’s “Cathedral Car” hit the rails for the first time (if anyone does I’d appreciate the date), but Reverend Smith’s first Baptist chapel car “The Evangel” was dedicated to its ministry on May 23, 1891 — 116 years ago, this week. May 20, 1690 - John Eliot, English missionary to the Native Americans of New England and publisher of the first Bible printed in America, dies at the age of 86. Eliot arrived in America from England in 1631 and within two years had translated the entire Bible into the Algonquin Indian language. May 21, 1382 - The "Earthquake Synod" in London condemns as heretical 24 theses from the writings of John Wycliffe. The synod gained this name because a brief tremor struck London interrupting the proceedings. Wycliffe later claimed that God sent the earthquake "because the friars had put heresy upon Christ. The earth trembled as it did when Christ was damned to bodily death". May 22,1967 - The General Assembly of the Southern Presbyterian Church (PCUS) adopted the Confession of 1967. It was the first major declaration of faith adopted by this branch of Protestantism since the Westminster Confession of 1647. May 24, 1543 - Polish astronomer and cleric Nicolas Copernicus dies in Poland. His heliocentric (sun-centered) concept of the solar system was considered radical and some theologians strongly criticized the theory because of its apparent contradiction of scripture. May 25, 1535 - After holding the city of Munster (which had been taken o0ver by radical Anabaptists) under siege for over a year, the army of the city's Roman Catholic bishop finally retakes the city. The Anabaptists, led by Jan Matthys, had acted on the prophecy of Melchoir Hoffman that Christ would soon return, and only Christians in Munster would survive. During the occupation, Matthys and his followers became increasingly despotic and maniacal, enjoying excesses while the people starved and introducing wild practices like polygamy. May 26, 1521 - The Edict of Worms formally condemns Martin Luther's teachings , and he is put under the ban of the Holy Roman Emperor. Those who fear for his life then kidnap Luther and hide him in Fredericks Wartbury castle.